Kelsey Pinckney was born and raised in southern California. She moved to Phoenix in 2013, where she has had the opportunity to be a part of the community in many different ways. 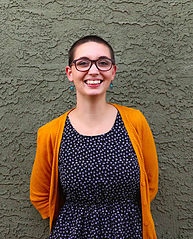 She is the Assistant Director of Four Chambers Press – a phoenix-based community literary magazine and small press whose mission is to give greater visibility to the literary arts and encourage their larger participation in the culture scene. Her role in the literary community in Phoenix has fed and intensified her love for writing, reading, and the huge role that literacy plays in human relationships and society in general. Kelsey has worked with youth in schools, after-school programs, and church groups since 2011, and believes it is the most important work she will ever do. She is currently attending Arizona State University for her BSW (Bachelors in Social Work), and lives in downtown Phoenix with her cat, Truman (Capote).